Beware when creating fields via SQL engine with 4Dv12/v11. Creating fields via SQL does not allow setting field property “Map NULL values to blank values”. The suggested work around is to define the field with NOT NULL constraint. The different outcomes of the two ways to create fields is terrible behavior because of lack of support for null values in the 4DDB engine. 4D seems to assume developers are either using 4D with all native code, or all SQL code, not hybrid solutions. Ultimately the concern to the developer is having assumptions regarding the data respected. Coming from previous version of 4D all fields have the property checked for mapping null values to blank values. Legacy applications can have code reliant on the assumption of no null values. In version 11.4, if you have NULL values in any field and then do an ORDER BY on that field, any records that contain NULL values will be removed from the Current Selection. Also displaying and saving null values to the database is even more difficult. 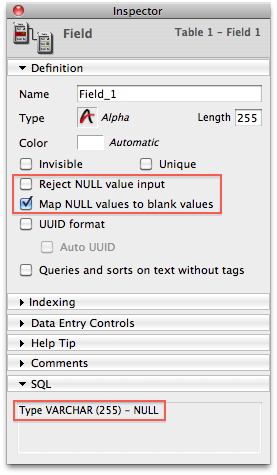 By default the “Map NULL values to blank values” field property is enabled. This field was created with NOT NULL constraint.